Representing half a moon cycle the fourteen spheres of La Luna reflect micro-views of the adjacent environment, the landscape, sky and life on the Lake. Wind and water currents move the tranquil bracelet of spheres as a single entity. 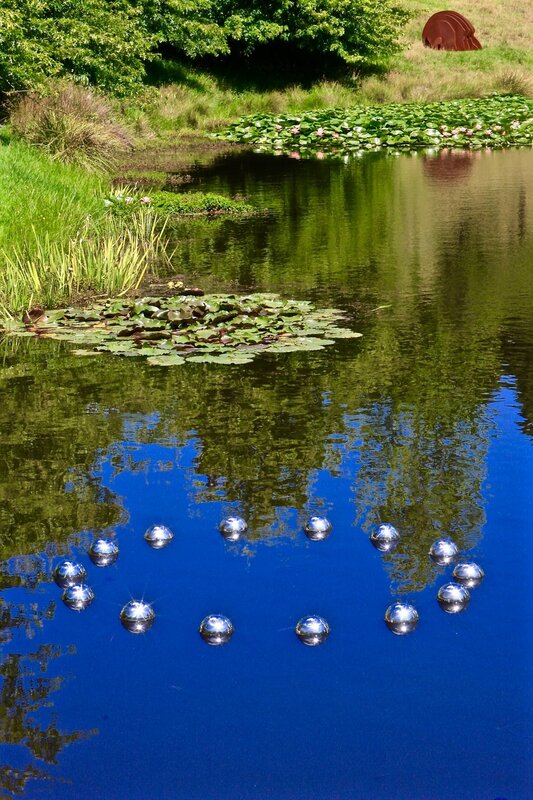 Anchored adjacent to the Glass House at Brick Bay, the sculpture combines mirror finished, stainless steel spheres. The Artwork is unique and playful and reflects itself and the lakeside surroundings. The fourteen highly polished stainless steel spheres reference half a moon cycle. Each element floats at the mid-way point. The spheres are connected at equal spaces to a submerged control ring, to create the floating sculpture. Dimensions: Each sphere is 250mm in diameter. The sculpture dimensions are variable.